A series of brand identities and products which represent modern Britishness, informed by consultation with young people across the UK. The project explores what representations of visual identity can reveal about national identity and belonging. In collaboration with Common Vision, part of Arts 50. Images by IOIA. See the full range and read more here. Flyer + poster for CamdenEsence Material Journeys exhibition by BA Textiles students at Central Saint Martins. Packaging for Timeless, a fictional brand designed to engage the public with issues around egg freezing and fertility. Project initiated, curated and designed by The Liminal Space. With the Wellcome Trust + LSE. Photography by Angus Mills. Final show catalogues for MA Material Futures at Central Saint Martins. Identity for My Body My Life, an installation designed to challenge abortion stigma by sharing women's stories. Project initiated, curated and designed by The Liminal Space. With the University of Oxford and Open University. Identity, catalogue and exhibition graphics for Form + Motion at the Cheongju Craft Biennale. Exhibition curated and designed by Faculty. Programme Partners: The Crafts Council and British Council. Suffrage Champions identity and banner design for Women in the Humanities at the University of Oxford, celebrating the women's suffrage movement at Oxford’s Bodleian Library. Project initiated, designed and curated by The Liminal Space. Identity for Urban Fabric, a research area based at Central Saint Martins as part of the Textile Futures Research Centre. Workshop exploring our sense of European identity following the UK's vote to leave the EU. Collaboration with Cecilia Wee, hosted by AND Publishing. This line of austerity lifestyle products is inspired by the @Conservatives twitter feed in the lead up and aftermath of the 2015 General Election #GE2015. Each of the nine products is based on the rhetoric of the week, offering you a limited edition record of the shifting narrative. Find out more about the project here. migrantspecies.com allows users to generate and download their own personal migration poster. These posters form a collection, building a more complex picture of identity and humanising the conversation about migration. A collaboration with Hettie O'Brien, Aoife Breen and Michael Pecirno. Identity for Illuminations Festival London 2016. In collaboration with image maker Rian Crabtree. 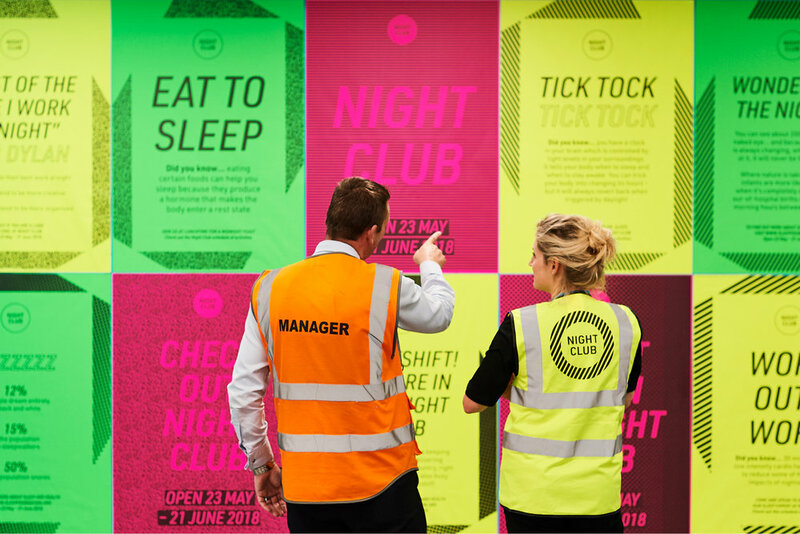 Identity for Night Club, a space to engage with shift work and sleep health. Project initiated, curated and designed by The Liminal Space. With the Wellcome Trust + University of Oxford + Co-op. Digital Catalogue for BioSalon event at Central Saint Martins, a joint initiative between the Design & Living Systems Lab and the Crafts Council. Common Thread catalogue + exhibition graphics at London Design Festival. Exhibition curated and designed by Faculty. Programme Partners: British Council + Anou.